Canon EOS 100D – a DSLR to wage war on CSCs? The diminutive Canon EOS 100D DSLR looks set to do battle with the growing army of compact system cameras (CSCs) from the end of next month. Canon says the 100D is 25% smaller and 28% lighter than the company’s current 650D DSLR. Trumpeted as the smallest and lightest DSLR on the planet, the EOS 100D is due to go on sale at the end of April, priced £569 (body only). Bosses hope it will attract consumers hooked on traditional SLR features like an optical viewfinder – appealing to those who shirk electronic viewfinders found on CSCs which Canon regards as a ‘compromise’. Although David Parry, from Canon UK’s Product Intelligence Team, said the firm is not targeting CSC users, the company will no doubt be hoping the 100D wins over those thinking of buying into a market born in 2008 when Panasonic announced the Lumix DMC-G1 as a smaller, lighter alternative to a DSLR. For its part, Canon sees its own mirrorless system camera, the EOS M – which was announced last year – as aimed at a completely different consumer to the DSLR devotee. Parry said he was not able to comment on whether the launch of the 100D is set to influence any plans for further Canon CSCs down the line. The 100D features an 18-million-pixel APS-C hybrid CMOS AF II imaging sensor built to allow phase-detection pixels to cover 80% of the imaging surface, in a bid to boost AF speed and tracking performance when using live view and shooting full HD movies. At the time of writing, Canon had yet to confirm the proportion of the imaging surface covered by phase-detection pixels in previous sensors. Weighing 407g and measuring 116.8×90.7×69.4mm, the 100D sports a fixed 3in (1040k-dot resolution) Clear View II touchscreen, a top burst rate of four frames per second and ISO 100-12,800, expandable to 25,600. Also included is a nine-point AF system, incorporating one cross-type sensor. To help cut down the camera’s overall size, the 22.3×14.9mm CMOS is housed in a ‘smaller’ sensor unit, explained Parry in an interview with Amateur Photographer. The dimensions of the AF unit have also been reduced, he added. New creative shooting options include the ability to preview filter effects alongside an unfiltered JPEG image – at the same time on the LCD screen in live view – to help the photographer before they take the shot. Filter effects include fisheye and miniature. In a nod to movie-makers, to coincide with the launch, Canon has unveiled a revamped IS version of its 18-55mm standard zoom, featuring ‘near-silent’ STM [Stepper Motor] technology to help reduce focusing noise. The EF-S 18-55mm f/3.5-5.6 IS STM boasts 4-stop Image Stabilizer (IS), a manual focusing ring and minimum focus of 25cm. The 100D will also be out in a £699 outfit that includes the new 18-55mm lens. Twin-lens 100D kit options will bundle the 18-55mm IS with a 40mm f/2.8 lens, priced £859. The new 18-55mm lens will be available separately, with a £239 pricetag. 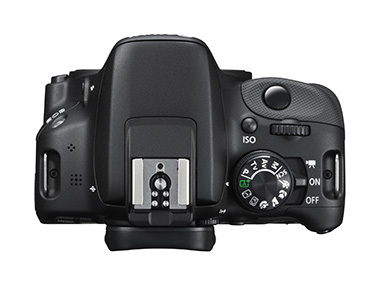 The 100D uses the same battery as the EOS M, which is designed to deliver 380 shots.